Discussion in 'More Accessories' started by PrinceOfCats, Nov 19, 2003. Sorry I haven't got a picture but does anyone know where I could get hold of a Dolce & Gabbana rosary chain? I live in England a long way from London so I'm looking for an online or mail-order source. If you know of shops that sell them then do tell anyway as D&G is always worth the trip. 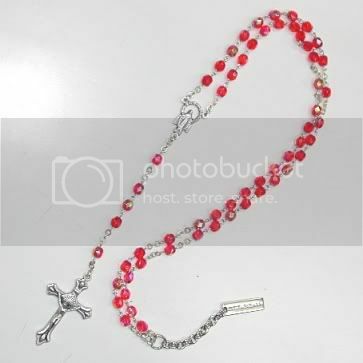 Real rosaries are horrible and expensive (a decent one costs a lot anyway). I have lots of Catholic friends. Thanks anyway, I'll just have to look around I suppose. Rosaries are not jewelery; they are a means of contemplative prayer. I wish designers would not take sacred items and make them commercial products. It's rude and disrespectful of people's beliefs. I believe it's meant to be. Also Dolce grew up in Sicily didn't he? Rosaries have 59 beads 9 of which are 'Our father beads' and the rest of which are 'Hail Mary' the 'Our Father' beads seperate the 'Hail Mary's into decades. See? I do know what a rosary is for I just choose to use it as a piece of jewellry. This is generally seen as accpetable in the UK, with Catholics as well. EDIT: NOT NINE! TYPING ERROR! Exactly! I'm Catholic myself, and when I see someone like Britney Spears wearing a bunch around her neck, it makes me so mad! She's the last person who should wearing one! Or if she does wear one, she shouldn't be parading around with it and behaving indecently! The same with Nicole Richie and the tattoo of a rosary around her ankle. I don't think people should be direspecting such a sacred thing. i really like them, but i'd never pay $200 for a rosary. As a Catholic, it makes me upset when people disrespect something we consider to be sacred. They aren't meant to be worn as necklaces! I was raised Catholic, but am not a very religious person. I have issues with any form of religion being worn as an accessory by somebody who does not follow the beliefs that the symbols are supposed to represent. Like all the non-Buddhists wearing the necklaces and screen prints of Hindu gods on tshirts. And rosaries are not any different. doesn't bother me! I like rosarys. I've a silver one with turquoise beads from my grandmother that I wear. ps i am a hindu... n i hav a picture of one of my gods on a t shirt... n if i had enough money n accessability to the shops... i wudda bought some of those voyage jeans.. that there was all the nonsense abt... which had hindu gods on them... they looked immaculate! Yes, rosaries ARE great. They, however, are not necklaces. And for the record, there are 6 large beads on which one prays the Our Father, 53 smaller beads on which one prays the Hail Mary, as well as a crucifix on which one prays the Apostles' Creed, and a medallion (usually) of Mary holding Jesus on which one prays the Salve Regina. Not to mention the longer lengths of chain on which one prays the Doxology. What's worse is that Britney claims to be a Kabbalist but has tattoos that she has gotten recently in which is against the religion. Tealady, I agree with you 100%. I do know that. My post Bday hangover was in full force and I couldn't type what I meant to say. I meant to type non-Buddhists wearing Buddha necklaces and the like and non-Hindus wearing the screen prints and such. I think it's cool if you would have worn the Voyage stuff. I saw that collection and thought it was great, but passed because I don't fully understand the imagery. My point being: if it does not relate to your religious beliefs, why would you want to wear it? Religion is a very personal thing and I think too many times it is exploited by the fashion industry. Especiall David Beckham wears it.. whatever!!! I'm confused as to why you guys are questioning people's personal decisions. Aren't we a free people to live and choose what we want to do? Remember the saying, "People who live in glass houses shouldn't throw stones." I was raised Catholic, believe in their prayers , but I try to use Buddhism AND Catholicism as a way of life. Is that so wrong?